Upside has nipped more basketball careers in the bud than any substance or shortcoming. It’s easy to get swept up in player projection, and everyone does it, fans, scouts and media members alike. Spend enough time in enough gyms and it eventually hits you: obtaining info in the field of prospect evaluation—from preps to pros and in between—is really just one big game of telephone. Everything is filtered through the court of opinion and agenda. And it often comes out messy. So, Thon Maker isn’t the first Thon Maker, or the last Thon Maker—he is simply the Thon Maker of the moment. His on-court acumen has been divisive seemingly from the beginning. Everyone has heard something about him. The discourse has swerved over time. The next Kevin Durant. A YouTube unicorn. An energy big with some room for development. A probable bust. Some are cynical perhaps out of spite for the overhype of his famed highlights, some really just don’t know better. Maker’s not a mystery man, but he’s certainly been a misrepresented one. The Bucks knew enough to take a chance on him with the No. 10 pick in June's draft. It was one of this year’s largest commitments to player development, given that Maker is, of course, skipping college entirely. His agent Jeff Schwartz also represents head coach Jason Kidd, which is certainly a business factor. But with recent organizational success stories including Giannis Antetokounmpo’s ascension and Jabari Parker’s ACL rehab, gambling on a mobile big with a chance to be more than a one-note bench player seems reasonable enough, particularly with the top tier of prospects off the board. Coming from South Sudan, then Australia, then two schools in the states and a prep school in Canada—plus a full-on Danny Almonte controversy—it’s still just a little bit crazy that Thon Maker is going to play in the NBA in a few months. He thinks so too. Sticking and staying sounds like an extremely reasonable place to start, given the finite number of NBA jobs and large number of pro basketball players in existence. This is the purpose of the NBA’s Rookie Transition Program, which has taken place for the last 30 years in New Jersey to try and teach the league’s future stars life skills and keep them out of trouble. Think of it like any onboarding process, but with extra multimillion-dollar levels of risk and reward. Now, logically, if one were looking to catch a seven-footer mid-nap, a decent place to start would be a college classroom. And that, of course, is a life experience the well-traveled Maker won’t have anytime soon, hence some reasonably tempered public opinions on his actual NBA readiness. He's the first preps-to-pros player since 2005, when Andrew Bynum, Monta Ellis and Amir Johnson were among the teenagers to make the leap. That group is largely still kicking it around the league, but to mixed results. 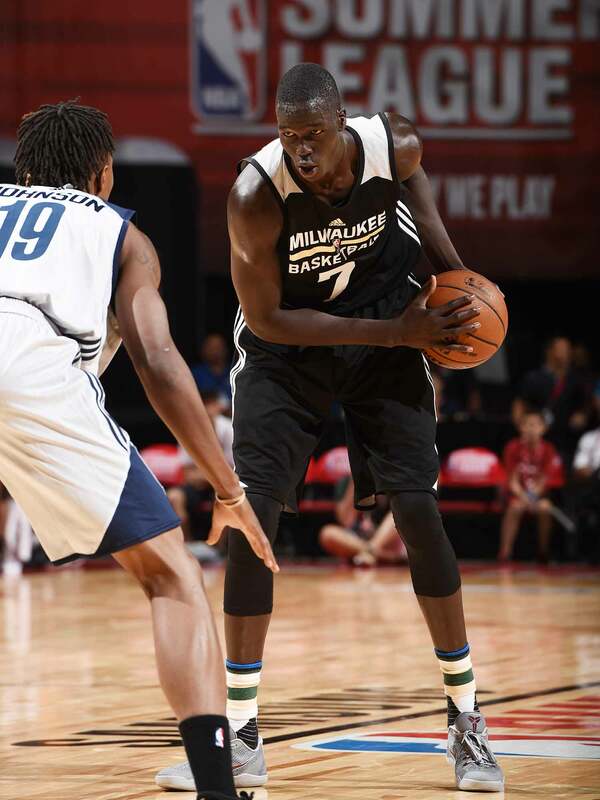 To his credit, everyone seems bullish on Thon Maker: The Person, who impressed teams in pre-draft interviews as much, if not more, than in his actual workouts. And like the other international arrivals among the 80 players attending this year’s program, Maker received special emphasis with regard to American taxes, immigration and culture shock. Topics like finance, healthy relationships and social media perils filled out a packed, boot camp-like schedule. Speaking to press at the draft combine in May, Maker did his best to dismiss his YouTube legend ego of old, and in some ways, any semblance of his own ego, period. He expressed his willingness to execute the finer points of the game, unknowingly becoming quite-possibly the first-ever lottery pick to tell the media how great he is at defensive rotations. While it’s fair to wonder about how his actual skills will look draped over the back of a stampeding Morris twin, it certainly helps to think he’s got at least one NBA trait in place: perspective. What else suggests Maker’s self-assessment might be right? His body, agility, and an environment in Milwaukee that lets young players cut their teeth and make mistakes. Relying on statistics from Las Vegas Summer League in any way is a dangerous game, but just to put it out there, Maker averaged a respectable 14.2 points and 9.6 rebounds in five contests and didn’t look utterly lost (though he shot just 37%). Not looking utterly lost at Summer League, for a kid skipping school? Major win. “I played for Duke for four years, and even I had a huge learning curve,” Battier notes. He mentions this fact as a truism in Maker’s defense, but one that could also be construed as a warning sign without conversational context. His point is that successful NBA transitions are more about maturity level than anything else. While cracks have been made about Maker's age, his success will depend far more on his willingness to adapt. Maker seems to be adapting to that mindset quickly. Lakers rookie Brandon Ingram, who trained with Maker heavily leading up to the draft, attests for his peer's work ethic, calling him "one of the hardest workers in our group" and "in-shape like crazy." In the meantime, Maker will head to Milwaukee and get settled. He calls it “relieving” to land there after a positive pre-draft workout. He met some new teammates at Summer League. “They’ve shown we could fit together, we are gonna be together and we’ve gotta find a way to jell early on,” he says. Maker’s been FaceTiming with Giannis, once just another extremely tall bundle of what-if himself. We don’t know yet how Maker fits in long-term or how many years away he is from being an impact player. But in the meantime, he just wants to make himself useful, and for what it’s worth, he’s made the getting-to-know-you part seem easy. “He makes a hell of a first impression,” says Taylor.